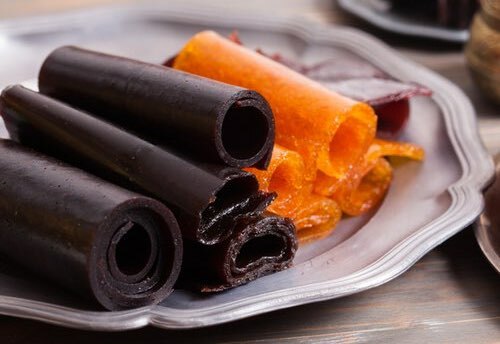 Use these Renaissance fruit paste recipes to make your own sweetmeats. Fruit pastes are similar to medieval leaches and today's fruit leathers. They consisted of the pulp of various fruits reduced by heat to a kind of thick marmalade, with the addition of, sometimes, nearly double their weight in sugar. They were colorful, very chewy, and very sweet tasting. 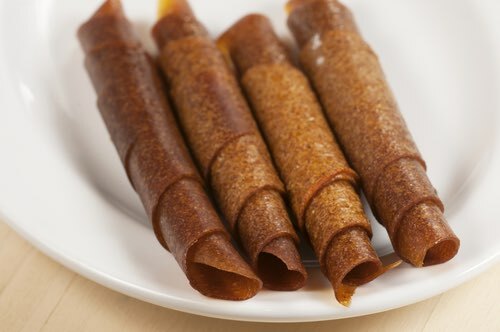 When making this celebrated sweetmeat, the fruit paste was boiled to reach the preferred consistence and then cut in strips or molded into fancy shapes such as rings or knots, dried, and then either left plain, or at times they were crystallized, or candied. Pastes in decorative shapes were often used to ornament desserts such as cakes, pies, tarts, and puddings. You will enjoy these easy-to-make candy treats that date from medieval times. Simply follow the Renaissance fruit paste recipes, and you cannot go wrong. Paste Royal is delicious and if you're in a hurry, this Renaissance fruit paste recipe is easily made using any flavor of store-bought marmalade. Take Quince Marmalade almoft cold, and mould it up with ſearced Sugar to a Paſte, then make it into what form you pleaſe and dry them in a Stove. 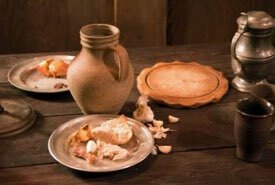 Take your Plumbs, and put them into a Pot, cover them cloſe, and ſet them into a Pot of ſeething Water, and ſo let them be till they be tender, then pour forth their Liquor, and ſtrain the Pulp through a Canvas ſtrainer, then take to half a Pound of the Pulp of Plumbs half a Pound of the Pulp of Pippins, beat them together, and take their weight in fine Sugar, with as much Water as will wet it, and boil it to a Can [candy] height; then put in your Pulp, and boil them together till it will come from the bottom of the Poſnet, then duſt your Plates with ſearced Sugar, and ſo keep them in a Stove to dry. 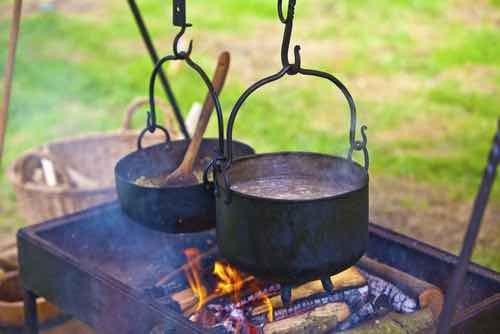 Take four Ounces of Valentia Almonds, blanched and beaten with Roſewater till it come to perfect Paſte, then take ſtale white bread, grate it and ſift it, and dry it by the fire, then put that to your Almonds with the weight of all in fine Sugar, beat them very well, and put in ſome Spice beaten and ſearced, then when it is a little cool, roul it out, duſt your Moulds and print it, and dry it in an Oven: you may if you pleaſe put the juice of a Limon into it when it is beating, you may make ſome of it into Jumbolds, and tie them in knots and bake them upon Buttered Plates, and when they are baked, ice them over with Roſewater, Sugar, and the White of an Egg, and ſet them into the Oven again for a while. Renaissance fruit paste recipes call for large amounts of sugar. Pastes were very sweet confections, even by Elizabethan standards. 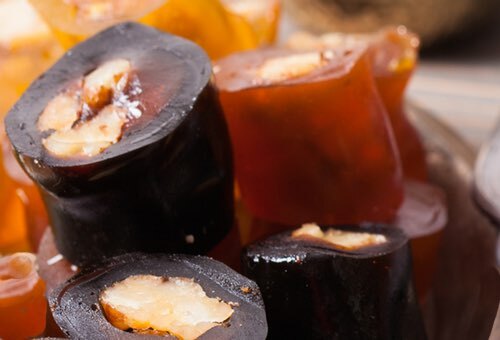 It's said that paste of plums was a favorite sweetmeat enjoyed by Elizabeth I, and it's not surprising since she had a ravenous sweet tooth and the bad teeth to prove it. Take your Apricocks, and pare them, and ſtone them, then boil them tender betwixt two diſhes on a Chafing-diſh of coals, then being cold, lay it forth on a white ſheet of paper; then take as much Sugar as it doth weigh, and boil it to a Candy height, with as much Roſe-water and fair water as will melt the Sugar; then put the Pulp into the Sugar; and ſo let it boil till it be as thick as for marmalet, now and then ſtirring of it; then faſhion it upon a Pie-plate like to half Apricocks, and the next day cloſe the half Apricocks to the other, and when they are dry, they will be as clear as Amber, and eat much better than Apricocks it ſelf. Take Pippins pared and coared, and cut in pieces, and boiled tender, ſo ſtrain them, and take as much Sugar as the pulp doth weigh, and boil it to a Candy height, with as much Roſe-water and fair water as will melt it, then put the Pulp into the hot Sugar, and let it boil until it be as thick as Marmalet; then faſhion it on a Pie-plate, like Oaken leaves, and ſome like half Plums, the next day cloſe the half Plums together; and if you pleaſe you may put the ſtones and ſtalks in them, and dry them in an Oven, and if you will have them look green, make the paſte when Pippins are green; and if you will have them look red, put a little Conſerves of Barberries in the Paſte, and if you will keep any of it all the year, you muſt make it as thin as Tart ſtuff, and put it in Gallipots.